Now apt-get dependencies and do build(s). You need a 512MB RAM R-Pi and this can take about 5 hours! Thank you so much for you tutorial. Just in case someone has the same issues I had, you also need to create the folder /data/db with proper rights an give execution rights to the /etc/init.d/mongod file at the end of the process. I’ve completed the steps above and I’m getting the following error when trying to start the mongod service. I can successfully start mongod manually with ‘sudo /opt/mongo/bin/mongod’. Hey Jeff, check your command line? I see a “:” (colon) after the “sudo”. This should not be there. Also do a “ls -l /etc/init.d/mongod” to see if the file exists. If not, check that you followed the above instructions and note the comments for any corrections or additions. Looks like the /etc/init.d/mongod file didn’t have execute permissions. Service starting now. Thanks again for this tutorial and your assistance! 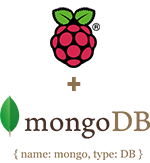 Hi – I’m quite new to pi and would like to try your solution but I’m bit daunted by the time it takes to build/install mongo. Is it not possible for someone to do the compile once and provide pre-compiled binaries that can be copied onto the target device? I’ve looked on the internet but can’t seem to find them so perhaps my thought process is wrong?